Rakesh Maria, the supercop who heads Maharashtra's Anti Terrorism Squad, explains the mindset of the modern terrorist at the Times Literary Festival. A correspondent listens in. 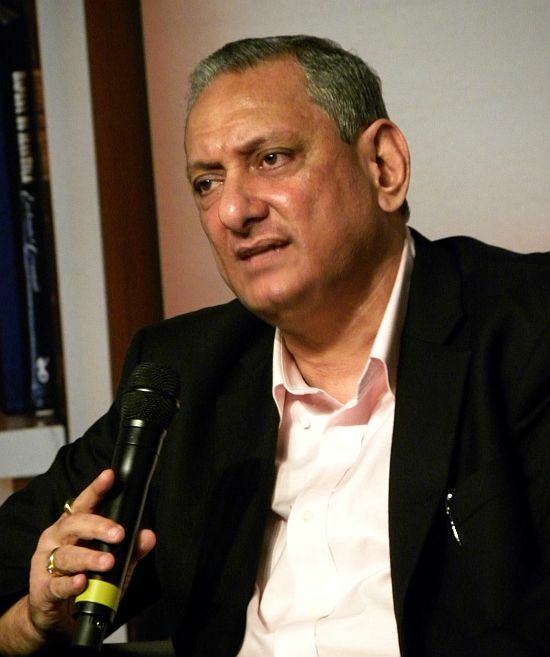 One of the stars of the Times Literary Festival 2013, held at Mehboob Studios, Bandra, northwest Mumbai, was undoubtedly Rakesh Maria, who heads Maharashtra's Anti-Terrorist Squad. He participated, Sunday, December 8, in a freewheeling discussion on crime and terrorism with banker Ravi Subramanian, well known on the Indian thriller scene for Bankster and The Incredible Banker, and Mumbai journalist S Hussain Zaidi, the best-selling author of Black Friday: The True Story of the Bombay Blasts and several other books. Maria's wife Preeti, his son, filmmaker Vidhu Vinod Chopra, Chopra's wife film critic Anupama Chopra and Adrian Levy, Cathy Scott-Clark, the authors of the recently released The Siege: The Attack on the Taj, were in the audience. Maria's wry accounts of intricate cases and their investigation was often punctuated by the applause of an appreciative audience. Hussain Zaidi: Have you ever thought of writing a book on your experiences? (Author) Ravi just mentioned that interactions with individuals (he meets) gives him a story idea. For us, in the police, every investigation is the unfolding of a story. It is a plot. Every case that we investigate has the germ of a story. Every accused, every witness is a character in a story. People ask me whether I am going to write a book. I do want to write a book. When we investigate a case, put up a charge sheet and the matter comes up in the court, what you see in the court are the bare facts. There is so much more to the investigation -- the human side to that investigation. The frustrations which are there. It is unbelievable. Hussain (Zaidi) wrote Black Friday on the 1993 blasts. It covered quite a lot. But there is so much more that can --- which did not -- come in the public realm. You take Adrian Levy and Katie Clark's book on 26/11 attacks. There is so much more which happened that time, which hasn't been written. The human side of it. The stories, whether in the control room or... so many. So many stories which can be written. One does not get time now because one is in service, there is no time absolutely. But once I retire, yes. I would sit down to write a book. 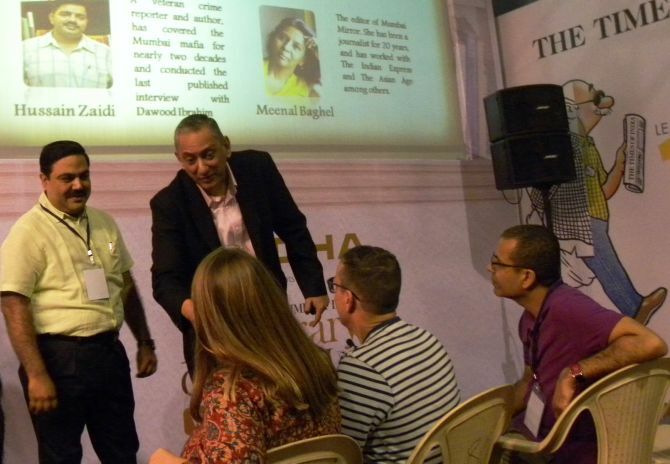 Image: Rakesh Maria interacts with journalists and the audience at the Times Literary Festival in Mumbai. Hussain Zaidi: At one time the Economic Offence Wing was under your supervision. You must have seen so many white-collar criminals. You must have seen so many criminals, who use technology or their education, to scam people and make money out of them. What is the most remarkable thing you have seen? Is the profile of the white-collar criminal changing? In the more conservative types of crime, robberies, dacoities, underworld crime, the perpetrators of the crime know that they are going to be caught. They know some day or the other they will be caught. In white-collar crime -- the normal thread that runs through all the scams, all the cheating cases -- is this thought in the mind of the criminal that he will never be caught. The scamsters are all educated. If they were not educated, they would not indulge in that type of crime. White-collar criminals have this feeling that they shall never get caught. They plan out the scheme in such a manner that they try to evade detection. But the moment this case comes to the police it is the easiest case to detect. Unlike the underworld, or a terror-related offence, where getting the criminal is easy, but thereafter trying to collect evidence subsequently is difficult. 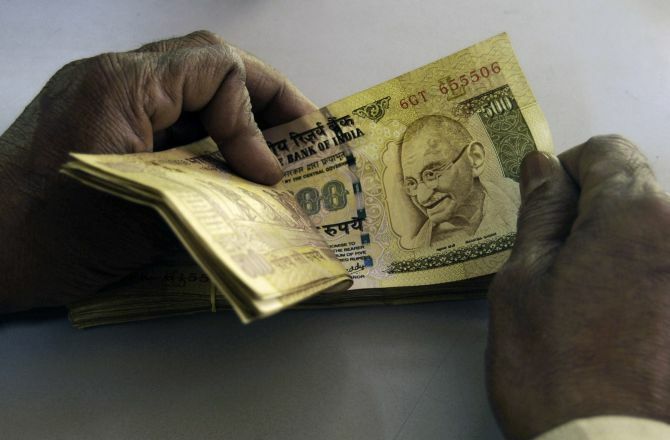 In white-collar crime there is a paper trail left behind. And the moment your reach (the end of it) you catch the criminal and the whole thing falls in place. Image: In white-collar crime there is a paper trail left behind, says Rakesh Maria. Photograph used for representational purpose only. Hussain Zaidi: In 1993 you indicted so many people in the Mumbai blasts case. You have seen their profile and their motivation and what made them do that terrorist act. In 2008 you were the only officer who interrogated Ajmal Kasab. Now in 15 years have you seen a change in profile of the terrorist, in motivation, the way they approach terrorism? What would you like to say about these two kinds of terrorists in fifteen years? In 1993, the Inter Services Intelligence in Pakistan used the Mumbai underworld to orchestrate the serial blasts. Over a period of time, this has changed. Now you have youngsters, who are radicalised, unlike the 1993 accused, where most of them had previous cases registered against them. Today's terrorist does not smoke, he does not drink, he does not gamble, he does not womanise. He is totally committed to the cause. The terror modules are very small. Today in the terrors modules we are seeing there are four to five. It is a very close-knit group. Even the families don't know. Even their friends don't know. It is a very close-knit group and the conspiracy remains within the group. There is a lot of change we are noticing in communication today. Unlike common perceptions... they don't communicate on the telephone. They meet. The conspiracy is discussed, the crime is planned out and then the crime happens. This is one difference, I have noticed. Today it is not so. It is a combination of various attacks. A bomb blast in a certain location, combined with a hostage situation, random and indiscriminate firing in crowded places and the police has to be a secondary agency. Earlier, we used to have to take care of railway stations, the bus stands so that nobody plants a bomb there. Today the Thomas Kean Commission (which investigated 9/11) asks the chief of CIA: Was it a failure of intelligence? (He said): No, it is not a failure of intelligence. It is a failure of imagination. That is what the challenge before us is. Today we are told that we should be the foretellers of doom. Prepare for the worst. Anticipate all types of scenarios and prepare for them. You don't know where and how the terrorist mind works. And that is why reading Mr Subramanian and other authors is a must for us. It helps anticipate the various scenarios by which they want to engage eyeballs. They want to attract the attention of the world. Just by placing a bomb in a train or a bus does not serve their purpose. They want something sensational. The more sensational (it is) that causes more publicity. This for us is the greatest challenge. This the basic difference between the terrorism of the '90s and the terrorism of today. Image: It's a combination of attacks that we face today -- like the 26/11 attacks in Mumbai, Kenya mall strike, says Rakesh Maria. Tiger Memon, Dawood Ibrahim, the entire 1993 plot (conspirators), yes, they used to drink, they used to womanise, they used to gamble. In 2008 we busted an Indian Mujahideen module which was responsible for blasts at Surat, Ahmedabad, Bengaluru, Hyderabad, Delhi, UP. They used Mumbai to send out e-mails to various channels half an hour before the blast saying: Beware big bang now. Stop us if you can. That is how we got into the act and we arrested 22 such boys. The case is under trial and charges are now being framed. Out of the 22, 13 were computer experts, one was an MBBS doctor, three or four were engineers. These are educated people who are doing this purely because they have been indoctrinated. The ISI today, they want to give that impression that it is home-grown terrorism, but the heads are based in Karachi. They are the people who are calling the shots. Arrest one (lot). These people take another six months to indoctrinate the next lot. It is the indoctrination from across the border which is (in play). 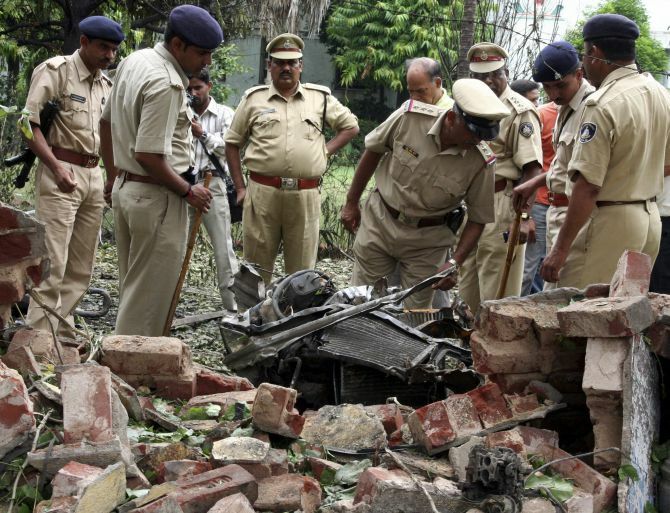 Image: Police personnel search for evidence near the site of a bomb blast in Ahmedabad in 2008. Hussain Zaidi: How do you come to know that you have a culprit? I am referring to the Neeraj Grover murder case. After a couple of meetings you started suspecting Maria Susairaj. How do you suspect that a person who has come to me with the complaint is actually the main culprit? You know if somebody is telling a lie. You can control your whole body, except your eyes. You may change the expression on your face. You may have a deadpan face. You may show the look of shock on your face depending on what the situation. But you cannot hide what is in your eyes. In our office, a police office, the moment a person enters a room he or she starts crying bitterly. The moment they leave the room they are perfectly okay. If you are swayed by emotions I don't think you will be able to detect cases. You have to leave your emotions/passions aside and then investigate a case. Over a period of time -- so many cases one deals with -- you come to know this person is lying and now it is a question of collecting evidence. Hussain Zaidi: How did you manage to track alleged Indian Mujahideen operative Afzal Usmani who escaped (in broad daylight) from a Mumbai sessions court? No crime is perfect. Despite what the intelligent people think --- that he or she has committed a perfect crime. Till date there has never been a crime which is foolproof and is perfect. It is a question of applying logic and sitting back and not getting pressurised or hurrying facts. 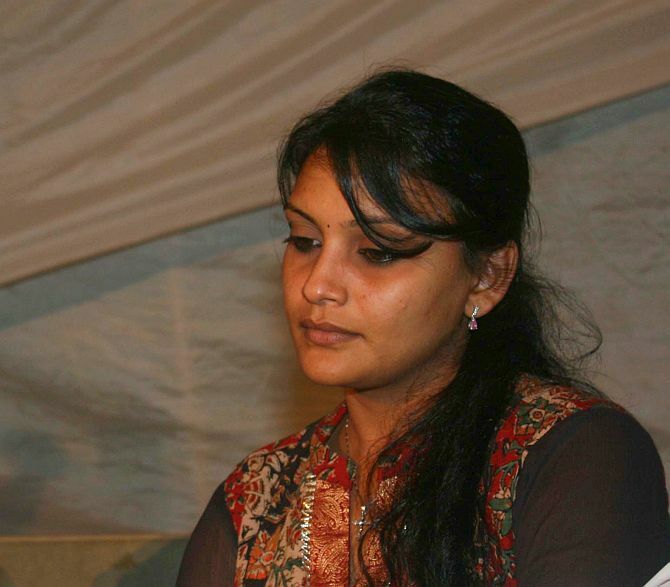 Image: Kannada actress Maria Susairaj, one of the accused in the Neeraj Grover murder case. She was acquitted later. Hussain Zaidi: In your 33 years of service you have dealt with hundreds of cases. Which do you think was the most difficult and important case to detect? Every case is the most important case. It is very important for the department that we detect the case. It is very important for the government that we detect the case. Hussain Zaidi: And it is very important for Arnab Goswami (laughs). 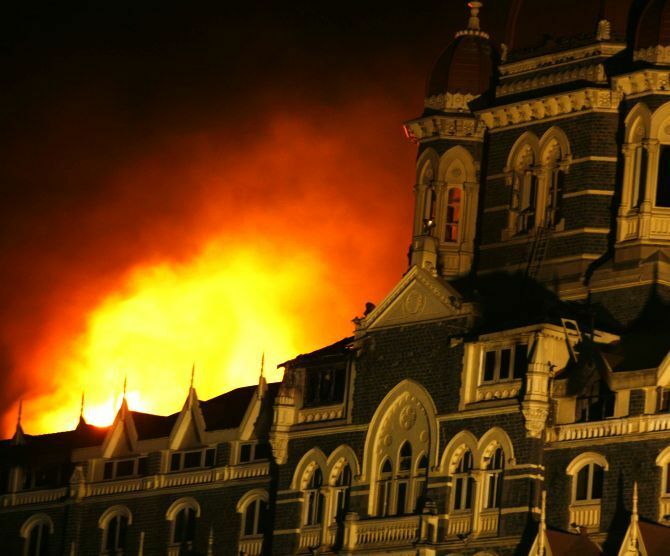 Whether it was the 1993 (Mumbai) blasts, the railway blasts (2006 and 2011), the Gateway of India blasts (2003), the German Bakery blast (in Pune, 2012), or 26/11 when it happened or the Indian Mujhadeen case. Every case, at that time, is the most important case, which hogs attention through the newspapers and the media. There is a lot of pressure on the government and the department to pick up the case. Suffice to say that criminal or the terrorist is adapting, evolving, improving with time, which makes our task more and more difficult with time. They learn from the mistakes of others. Today once we detect a case, Hussain and others will ask how this case was detected. So we try to show how we detected the case. (That's why) In the past when we have arrested terrorists and done a search of their homes we have found newspaper cuttings of court proceedings. The court proceedings covered by the newspapers. What transpired. Who said what. What the defence advocate said. What the prosecution said. What was the judgment. They are learning all the time -- making our task more and more difficult. Hussain Zaidi: But the most difficult case to crack? A mother cannot differentiate between her children. 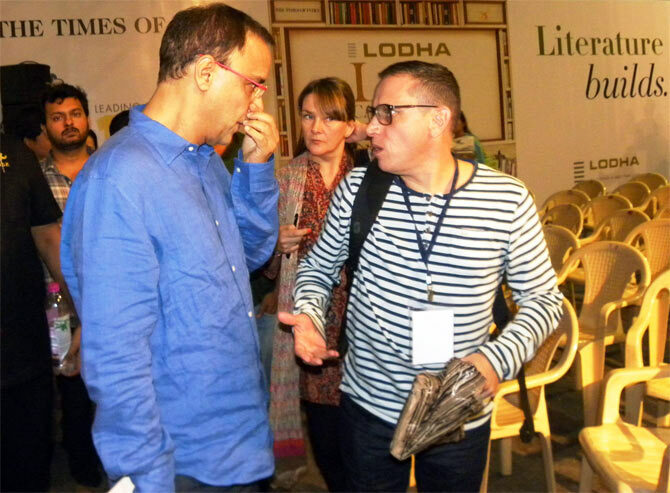 Image: Adrian Levy, author of The Seige, and Bollywood producer Vidhu Vinod Chopra exchange a few words. Co-author of The Seige, Cathy Scott-Clark stands behind them. Question from the audience: How has the police force evolved to meet this challenge? Every time a crisis takes place we get the best of equipment. During 26/11, by about 22.40 -- things started by about 21.47 at Leopold (Cafe, Colaba) -- by about 22.40, within an hour, we had an interception of the conversation going on between the terrorists and their handlers. The equipment is definitely here with us. The expertise is definitely there with us. There is a lot of international cooperation today between various countries. Our people going... people from outside coming here... it is an ongoing process. A lot of equipment has come. We have 57 speedboats today for patrolling the coastline... Equipment wise we are very good. 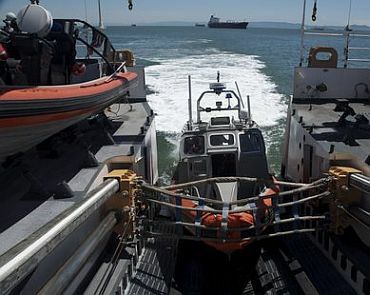 Image: 'Fast Interceptor Boats, built by Goa Shipyard Limited, especially for the coastal police, can cleave through the water at 70 kilometres per hour,' reported Ajai Shukla. Another member of the audience: Do you fear for your life? The moment you joined the service, you knew what you were in for. And being posted to a city like Mumbai, with its underworld, with its terror modules, you know you are dealing with the scum of the earth. It is part of your work. It doesn't frighten me for myself, but it frightens me for my wife, for my sons. Because the threat calls come to them. The abusive calls come to them. The letters come to them, threatening them. My sons in their schools -- there were two evacuations exercises. Telephone calls to the schools saying that because they were my children there was a bomb kept in a tiffin box in the school. The whole school had to be evacuated. These are things that frighten you to some extent. I am thankful to my family who doesn't allow this fear to come onto me. Another member of the audience: Is political pressure (an issue)? And fortunately in a state like Maharashtra, unlike what the film people project (smiles at Vidhu Vinod Chopra. Laughter), Singham style and this style I don't think it happens in Maharashtra. The press is very aware today... In Maharashtra the rule of law is still there. The respect for the police is still there. If I keep sitting down with the politicians for a certain posting or for a certain transfer, then he or she knows that this person has come to me for this work and if I extend this favour I can ask for my pound of flesh subsequently. I don't think that happens, especially in sensational cases, with so much media focus, it is very difficult. Image: Rakesh Maria greets journalists and writers Adrian Levy and Cathy Scott-Clark, who wrote The Seige, during the event in Mumbai. At his right is banker and author Ravi Subramanian.